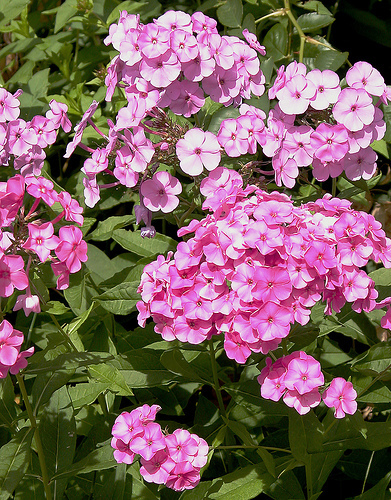 Phlox is a genus of 67 species of perennial and annual plants in the family Polemoniaceae. They are found mostly in North America (one in Siberia) in diverse habitats from alpine tundra to open woodland and prairie. Some flower in spring, others in summer and fall. Flowers may be pale blue, violet, pink, bright red, or white. Many are fragrant. Fertilized flowers typically produce one relatively large seed. The fruit is a longitudinally dehiscent capsule with three valves that sometimes separate explosively. Some species such as P. paniculata (Garden Phlox) grow upright, while others such as P. subulata (Steak Phlox) grow short and matlike. Israel is one of the world's leading fresh citrus producers and exporters, including oranges, grapefruit, tangerines and the pomelit, a hybrid of a grapefruit and a pomelo, developed in Israel. More than forty types of fruit are grown in Israel. In addition to citrus, these include avocados, bananas, apples, cherries, plums, nectarines, grapes, dates, strawberries, prickly pear (tzabbar), persimmon, loquat (shesek) and pomegranates. Israel is the leading producer of loquat (shesek) after Japan. 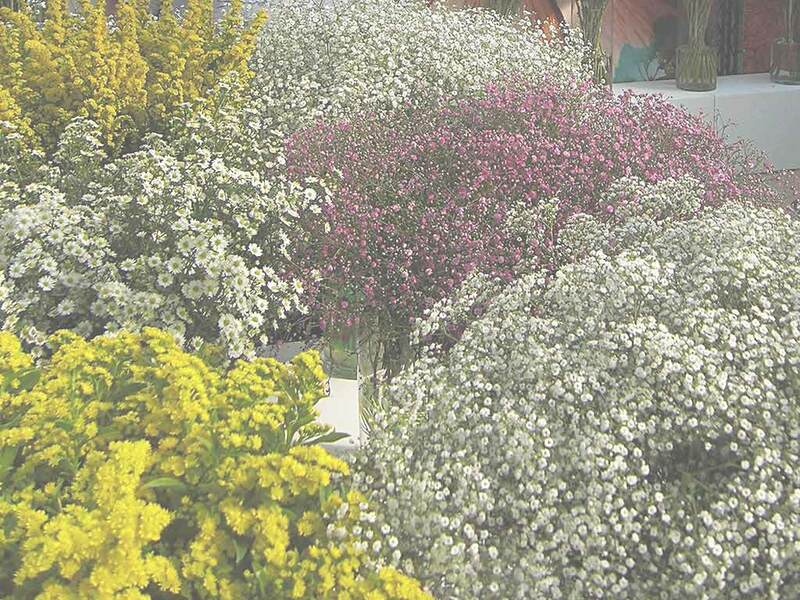 Farm fresh grower-direct flowers from following varieties: campanula, solidago, lisianthus, rose spray, ixia, matricaria, gladiolus, ozothamnus, matthiola, calla, alstroemeria, banksia, gomphrena, godetia, aster, curcuma, kniphofia, cotton, strelitzia, green bell, eustoma, liatris, trachelium, kangaroo paw, agapanthus, anigozanthos, desert yearning, veronica, echinops, roses small head, tanacetum, dianthus, gypsophila, iris, capsicum, grevillea, tulip, hippeastrum, roses tea, paeonia, lilium, narcissus, roses, sunflower, chrysanthemum, gerbera mini, prothea, delphinium, eremurus, statice, bouvardia, gypso, globularia, achillea, leucospermum, antirrhinum, craspedia, aconitum, anemone, asclepias, carthamus, wax flower, crocosmia, celosia, phlox, ranunculus, ornithogalum, moluccella, gerbera, gerbera standard, astilbe, freesia, limonium, etc. Fresh cut foliage of the following varieties: aralia, rotem, ruscus, fern, adenanthos, prunus, bear grass, leucadendron, myrtus, hypericum, cyperus, grevillea, artichoke, kochia, cocculus, melaleuca, philodendron, pittosporum, viburnum, palm, euonymus, croton, acacia, cycas, eucalyptus, steel grass, rhamnus, agonis, cotton, chondropetalum, asparagus, euphorbia, photinia, murraya, myrica, hibiscus, aspidistra, monstera, salix, cyrtomium, myrsine, hedera, etc. Fresh herbs and lettuce salads from leading Israeli growers: lemon balm, rucola deluxe, arugula baby, salicornia, thyme, baby spring mix lettuce, oregano, bulls blood, marjoram sweet, basil, mint, arugula, mizuna, chervil, coriander, rosemary, sage, red chard, parsley curly, lemongrass, dill, basil red, chives, sorrel, spinach, savory, tarragon, arugula deluxe, tatsoi, peppermint, basil green, lemon grass, romaine lettuce, parsley flat, rucola baby, marjoram, lollo rosso lettuce, rucola, baby mix salad, etc. Used as spices and seasoning herbs herb in recipes of healthy food cooking. All year long best price fresh herb and salad wholesaler supplies. Our produce can be delivered worldwide by air cargo carriers to the following international destinations: Switzerland, New Zealand, Canada, USA, Taiwan, Azerbaijan, Uzbekistan, Venezuela, Denmark, Norway, Sri Lanka, Czech Republic, Netherlands, Malaysia, Turkmenistan, Latvia, UK, Nicaragua, China, Macedonia, Armenia, Cyprus, Slovakia, Kyrgyzstan, Belarus, Finland, Iceland, Republic of Ireland, Brazil, Bosnia, Kazakhstan, Austria, Greece, Monaco, Ecuador, Gibraltar, Romania, Ukraine, Turkey, Liechtenstein, Costa Rica, Tajikistan, Germany, Spain, Argentina, Peru, Holland, Italy, Singapore, Mexico, United Kingdom, Belarus, Sweden, Thailand, Luxembourg, Slovenia, Indonesia, Australia, Vietnam, Bulgaria, CIS countries, Estonia, Laos, Belgium, Colombia, Paraguay, Ukraine, South Korea, Georgia, Chile, Uruguay, Croatia, Bolivia, Japan, Malta, Hong Kong, France, Portugal, Hungary, Moldova, United States, South Africa, India, Lithuania, Andorra, Russia, Panama, Kazakhstan, Philippines, Poland, etc.